Protect yourself and your company when dealing with wide-ranging FDA enforcement measures. Thompson’s FDA Enforcement Manual is THE comprehensive online resource guide to the Food and Drug Administration’s enforcement authority, policies and practices for the drug, medical device, biologics, food, cosmetics and tobacco industries. Food safety crises, import alerts, supply chain investigations, good manufacturing practice inspections — FDA enforcement officials have never been busier. And lawmakers have proposed to give the FDA more authority and personnel to police the products under its jurisdiction. Meanwhile, the agency has only begun to flex the new enforcement muscle already provided by recent legislation, which gave the agency sweeping new powers to order postmarket studies, mandate labeling changes, gain access to records before an inspection, and require reports on clinical trials — and boosted the penalties for noncompliance. All of these developments put your organization under the FDA’s enforcement microscope. You need to be ready. Thompson’s FDA Enforcement Manual will help you manage potentially expensive and time-consuming FDA enforcement activity by outlining the enforcement process; explaining the powers that the agency has during the process as well as the rights of companies and individuals targeted for enforcement action; and offering practical expert help on how to deal with FDA personnel and procedures. Your full-year subscription includes our two-volume manual set that provides details on all the laws and regulations, PLUS a complete guide and analysis on what companies can expect in the event of an FDA enforcement action; practical step-by-step guidance on every enforcement procedure available to the FDA — from administrative enforcement authority such as inspections, Warning Letters and recalls, to judicial enforcement authority such as seizures, injunctions and prosecutions. Your 12-month subscription comes with newsletters and updates so you’re always working with current information. Order today…protection is your best bet! 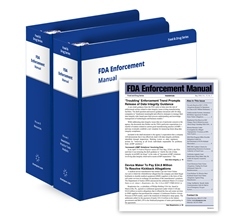 You will receive the two-volume FDA Enforcement Manual in print and/or access to the manual online at fda.complianceexpert.com. Based on the delivery method you choose, your annual subscription also includes quarterly print and/or rolling digital updates, news, analysis and more at no additional charge for the 12-month subscription period. Additionally, online subscribers receive access to our FDA Enforcement Letter Database. If you have any questions or would like information about bulk pricing or site licenses, please contact Client Services at 800-677-3789 or by emailing service@thompson.com. Arthur N. Levine is a retired partner of the Washington, D.C., law firm of Arnold & Porter Kaye Scholer L.L.P., where he counseled pharmaceutical and medical device companies on a wide variety of compliance and regulatory issues. Before joining the firm, he was the Deputy Chief Counsel for Litigation at the Food and Drug Administration. In this capacity, he served as the FDA's principal legal advisor on compliance and enforcement matters and processes, supervised all litigation involving the FDA and represented the agency on enforcement and litigation issues with the Justice Department. Before becoming the Deputy Chief Counsel, he prosecuted cases on behalf of the FDA, including several precedent-setting cases involving medical devices and blood banks. He taught for several years as an adjunct professor at The George Washington University National Law Center. In 2009 he received the Food and Drug Law Institute’s Distinguished Service and Leadership Award. Arthur N. Levine is author and editor-in-chief of FDA Enforcement Manual. Copyright © 2019 Thompson FDA, a division of CBIS. All rights reserved.